Follow our custom home process guide to cut your learning curve in half. See how our project management process stops 50% of mistakes and saves hours. Do You Want To Build A Custom Home? For over 30 years our home building division has designed and built small homes, large homes, contemporary homes and traditional homes, ranging in size from 2,300 to over 20,000 square feet. For over 30 years our remodeling division has transformed homes in Northern Virginia by renovating and remodeling kitchens, bathrooms, garages, porches, decks, basements, and more. Over the years, we’ve met with many homeowners who are uncertain as to whether they should build a new home or remodel their existing one. They’ve come to the realization that their current home no longer fits their family’s needs, but they’re unsure on how to best remedy the situation. At Foley Development Group, we understand. When you decide to construct a new home or remodel your current space, you’re making a major financial decision that is far-reaching. Our goal as a full-service custom home builder is to help you make the right choice. We know how important your home is to you and your family, and we will do whatever it takes to meet and surpass your expectations. We are dedicated to providing the highest quality work and to getting the job done right the first time. From one-room remodeling to new home construction, Foley Development has what it takes to help you move from dream to reality. We provide you with creative and innovative solutions that make your home not only more beautiful, but more enjoyable to live in. 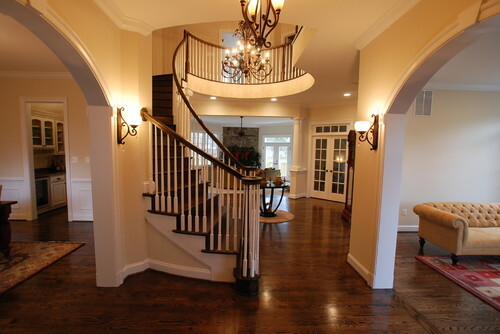 There is no greater accomplished custom home builder or remodeler serving the greater Northern VA area. We believe effective communication and teamwork are the foundation of every successful home build. When it comes to experience, quality workmanship and value, Foley is the region’s leader in designing and building high-quality residential properties. Our three decades of experience have helped us gain a real understanding of how people use their homes, and we bring to you a keen eye for designing and creating warm and inviting living spaces. Every job we do is given the same level of attention from start to finish. If you plan to custom design and build a new home, we’ll handle the entire project from lot walkthrough to construction. If you want to remodel or renovate your home instead, we’ll make sure the process goes smoothly, reshaping your existing space into one that suits your family’s current needs. At Foley Development, we’re proud of the dedication and hard work we bring to each and every client’s custom build or remodeling project. You’ll often hear us talk about the Foley process, but in truth, we want it to be your process, too. We’re in the business of creating spaces for living, whether that means a relaxed entertainment or family gathering spot, or a light and airy bedroom sanctuary. Our process includes listening, advising and adjusting. Our team understands there will be challenges along the way and are experts at laying out all your options, keeping in mind your budget and time specifications. Our unwavering goal is to make your remodeling process a positive, fun, and rewarding experience. As one of the most widely respected custom home builders in the Northern VA area, Foley Development is deeply committed to combining superb craftsmanship with sustainability, comfort and value. We build all types of custom homes, on all types of lots and want to be your home designer and builder of choice. You can find our clients’ most frequently asked questions about our new home design-build process covered here, but we welcome the opportunity to answer any others you might personally have. It’s helpful to be able to visualize what your final design will look like. Our remodeling case studies show how we can assist you in transforming your home. Through ongoing communication, we work hard to ensure each project results in the beautiful home our clients’ dream of. Your happiness is our success. Located in Reston, VA, we serve homeowners throughout the greater Northern VA area. Our superior craftsmanship and exemplary customer service is well-known throughout the region. We have the knowledge it takes to manage the most critical aspects of your project, including local and state building codes and ordinances. Our goal is to make the process easier for you, so we act as a liaison with local jurisdictions and building inspectors, coordinate all work with the area’s best subcontractors, and manage the ordering and installation of all products and services. We’ve always believed that our clients are also our friends and neighbors. We may be an award-winning, locally and nationally recognized custom home design firm, but we’re dedicated to the local communities we serve. We reside in Great Falls ourselves, and we embrace a family-oriented approach to everything we do. Our customers’’ needs come first and we define our success by your satisfaction, including long after the work is completed. Additional space for your children, or a suite for aging parents. The perfectly-sized house in the right location with all the amenities particular to your lifestyle. An update to your home’s existing architectural style. Why now is a great time to build a custom home. The common misconceptions about building custom homes. Building your custom home the right way.